The insignia of the 614th Bomb Squadron, 401st Bomb Group. Painted glass window in the Church of St Mary the Virgin, Church Street, Weldon, NN17 3JY. The window was originally in the chapel at the base and was donated to the church when the base closed. The colour is painted on the glass. Poem 'In memoriam, Members of the 401st BG(H), Deenethorpe' displayed in the Church of St Mary the Virgin, Church Street, Weldon. The caption reads 'On the 5th August 1944 the American flag was presented by Colonel Hal Bowman the 401st Bombardment Group (H) commander to the Bishop of Peterborough as a token of friendship'. The flag is now displayed in a triangular oak case in the Church of St Mary the Virgin, Weldon. Roadside memorial to the service of the 401st Bombardment Group (H) at Deenethorpe airfield, Station 128. The location is latitude 52.495456, longitude -0.587618, and is approximately 140 yards from the southern end of the NW-SE runway. Close-up of the roadside memorial to the service of the 401st Bombardment Group (H) at Deenethorpe airfield, Station 128. Detail of the roadside memorial to the service of the 401st Bombardment Group (H) at Deenethorpe airfield, Station 128. Airfield plan on the base of the roadside memorial to the service of the 401st Bombardment Group (H) at Deenethorpe airfield, Station 128. 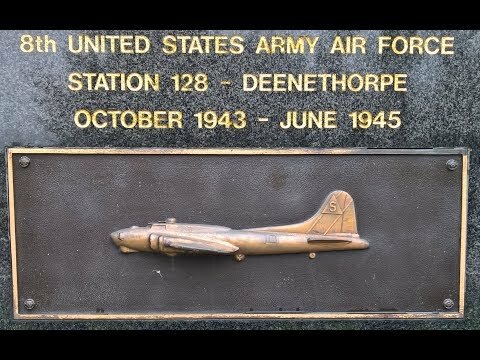 Video of the memorials to the service and sacrifice of the USAAF 401st BG(H) based at Deenethorpe, station 128. The video covers two locations: the roadside memorial adjacent to the site of the airfield, and the local church in the village of Weldon. Down N Go participated in mission number 132 which was a bombing mission over Weimar. Shot down 31 December 1943 in B-17 #4237770 'Flak Rat. ' Killed in Action (KIA). Shot down 9 April 1944 in B-17 42-38162. Killed in Action (KIA).